For On Her Majesty’s Secret Service‘s climax battle at Piz Gloria, James Bond wears a medium blue anorak with matching trousers or salopettes. The suit of anorak and trousers is made of wind-proof and waterproof material and is lined for warmth. An anorak is similar to a parka, but it is distinguished by being hip-length instead of knee-length, is a pull-over and has drawstrings to cinch the waist. The waist drawstrings prevent the bulky anorak from being completely shapeless, but they also help retain warmth. These features of the anorak are all present on Bond’s example. The anorak also has a large hood that cinches around the neck with drawstrings. The anorak’s full fit does not impede movement, and Bond moves quite well in it. It has straps with a slide-buckle on the sleeves to keep the arms warmer. It is detailed with inset pockets on either side of the top of the chest, which have velcro-secured flaps. There are also inset hip pockets on either side that close with a zip fastening. Bond’s anorak also has a strap that connects the bottom of the front with the bottom of the back between the legs. I am unable to tell how the strap is fastened, though I would guess it uses velcro. It keeps the coat secured when Bond is jumping and sliding about, as well as in strong winds, but it should hopefully come easily undone if there is too much stress on the strap. A strap between the legs is one place a secure fastening is not a good thing! Whilst the strap pulls the anorak tightly in front, it hangs looser in the rear. The coat was probably designed for winter sports, and that’s why it has the strap. Notice the strap between Bond’s legs. The medium blue trousers that match the anorak are tucked into black weather-treated suede or suede-like ankle boots with thick black rubber soles. They have a thin strap over the vamp that fastens with a steel buckle over the sole on the right side of the boot. Bond wears black leather gloves with a thick insulating lining, and the seams are sewn on the inside. The gloves are gathered at the wrist and secure with a slide-buckle on the sides. Under the anorak, Bond wears a very thick steel blue wool mock poloneck jumper. Only a peak of the ribbed polo neck collar and a ribbed cuff of the jumper is seen, and the jumper is seen only very briefly. Draco wears the same outfit as Bond, though he wears a light brown leather utility belt over his. Draco’s men dress similarly in white anoraks and white trousers, but in the same mock polo-neck jumpers and black boots that Bond and Draco wear, and a little more of the jumper can be seen on them. Bond’s outfit is provided by Draco and is neither his own outfiit nor something provided by MI6. Draco in the same outfit as Bond, but with a utility belt. I’d take a guess from that photo of Bond with the St Bernard that the strap between his legs is simply a strip of elastic that he would step in to just to stop the coat riding up. Sewing it at either end would be stronger than Velcro. This is a good looking outfit, Lazenby looks like he means business. Since the anorak is pulled over, a strap sewed at either ends isn’t possible. It has to be fastened either by velcro, button or a buckle. Would you consider doing an article on the sizes and shapes of shirt collars in relation to how they flatter faces? I’d like to hear your thoughts on exactly why Daniel Craig’s T&A collars “overwhelms” his face as opposed to the larger Tom Ford Collars. I think that would be an interesting topic. I’ll second (third!) that suggestion! I will get to work on this! 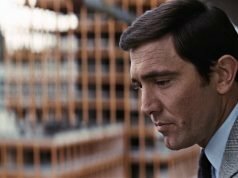 I wrote that the Brioni collars that Craig wears with his lounge suits (not the Turnbull & Asser collar with the dinner suit) in Casino Royale overwhelm Craig’s face in neck. The Brioni collars are a little taller than the Tom Ford collars and bring the collar just a little too close to his face. The Tom Ford collars are also a little too large but they sit a little lower. The Turnbull & Asser collar (with the dinner suit) sits lower and looks good on Daniel Craig. This is excellent. Athletic, appropriate, and fitting for the youngest and most athletic of the Bonds. The anorak suit is utilitarian without being very flashy. It suits Bond and the circumstances well. This would have been issued to him by Draco, then, seeing as he is wearing an identical suit. I agree completely with the comments and observations. Yes, Bond’s sportswear was never surpassed by this outfit which looks as fresh to day as in 1969. It looks great here in Blu Ray (I’d love to find similar to wear whilst doing my mountain hikes) and as I’ve only just bought a Blu Ray box set it’s high time to have a look again at the Bond movie which has the most merit of them all. The strap that goes underneath the anorak is from the para smock jacket which is used by paratroopers whilst jumping out of planes. It stops the jacket from flying up. 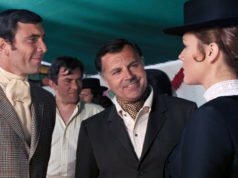 Off-topic, but I was wondering when the last time Bond wore a (formal) hat on screen was? 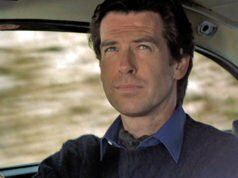 I am drawing a blank on anything later than Dalton’s top hat in “Licence To Kill”, but I’ve never been very engaged with Brosnan’s films, so I may be missing something obvious there. If you haven’t done it already, Matt, maybe an overview of Bond’s headgear and how it changed over the decades would be interesting? I guess it would almost all be from the 1960s, but could still be fun. The material is surely Ventile. Still the Arctic material of choice for the SAS and British paras. The blue ski outfit looks better than Craig’s Lady gaga outfit in Spectre. Much more masculine than in Spectre. Does anyone know who made the gloves?